DJ Press Play: Crochet This! Oh, and a great new recipe to try - a quinoa and acorn squash casserole. Yum! I'll send that along. 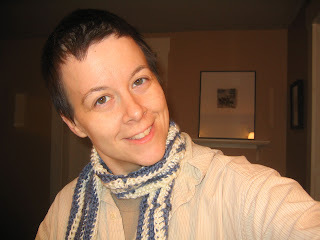 Your scarf even received a comment yesterday from Judith, a woman who makes her own wool yarn! Not something like "Ugh! I can't believe she used ACRYLIC!" Mission Accepted: Let me go measure my wrist now!